Pitseolak Ashoona (Inuit, 1904 – 83), Migration towards Our Summer Camp, 1983. Lithograph, 26 x 20 inches. Courtesy Dorset Fine Arts, Toronto, Ontario, Canada. 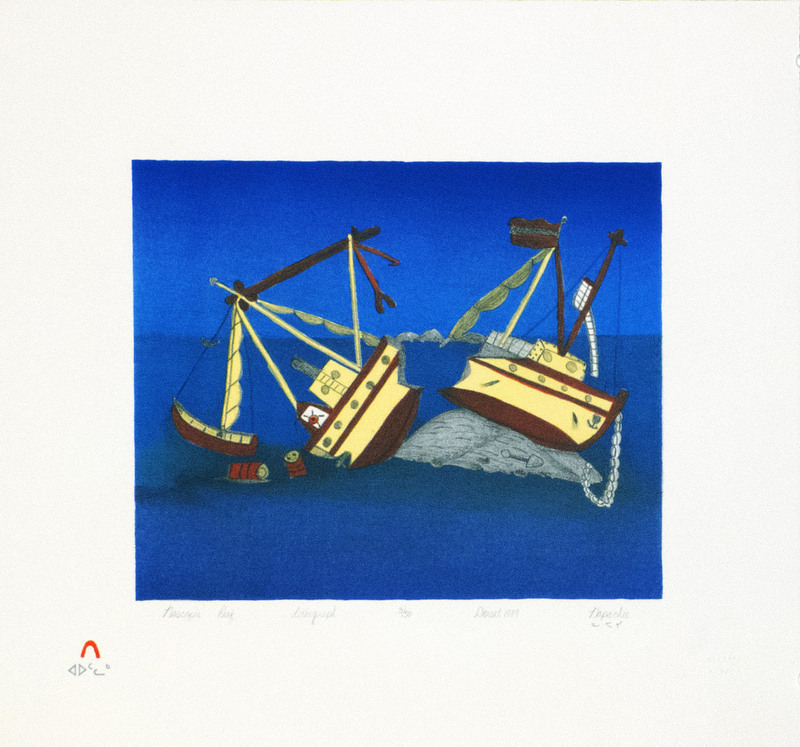 Napachie Pootoogook (Inuit, 1938 – 2002), Nascopie Reef, 1989. Lithograph, 17 x 19 inches. Edward J. Guarino Collection, Yonkers, New York. Annie Pootoogook (Inuit, 1969 – 2016), A Portrait of Pitseolak, 2003 – 2004. Pencil crayon and ink on paper, 26 x 20 inches. Edward J. Guarino Collection, Yonkers, New York. Loosely translated, the Inuktitut word Akunnittinni means “between us.” This exhibition chronicles a visual dialogue between an Inuk grandmother, mother, and daughter – Pitseolak Ashoona, Napachie Pootoogook, and Annie Pootoogook. Their artworks provide a personal and cultural history of three generations of Inuit women whose art practices included autobiographic narratives and chronicled intimate and sometimes harsh memories and historically resonant moments. The prints and drawings on view also include sardonic references to pop culture that now infuses everyday life in Kinngait (Cape Dorset), as well as nuanced depictions of family and village life. Kinngait is a remote Arctic community located on Dorset Island near Foxe Peninsula at the southern tip of Baffin Island in the Qikiqtaaluk Region of Nunavut, Canada. The region is known internationally for their artwork, produced in places like the now famous Kinngait Studios (West Baffin Eskimo Co-operative) since the 1940s. Pitseolak Ashoona, Napachie Pootoogook, and Annie Pootoogook are among the most recognized artists from this region. Pitseolak was born in 1904 on Nottingham Island in the Hudson Straights, while her family was en route from Sugluk (now Salluit) on the north coast of Arctic Quebec to the south coast of Baffin Island. She spent her childhood in several camps on the south Baffin coast. As a young woman she married Ashoona and bore seventeen children. She is the mother of several Cape Dorset artists, the Ashoonas; Ottochie, Komwartok, Kaka and Kiawak; and Napachie Pootoogook. Pitseolak was among the first in Cape Dorset to begin drawing, and the most prolific. Her best drawings were of “the old Eskimo ways,” a way of life deeply embedded in her memory. Her vast legacy of original work now resides on long term loan at the McMichael Canadian Art Collection where it continues to be photographed, documented and exhibited. Napachie Pootoogook was born at Sako, a traditional Inuit camp on the southwest coast of Baffin Island, Northwest Territories, Canada. In the mid-1950s, while living at Kiaktuuq, she married Eegyvukluk Pootoogook, who later became one of the main printers in the Cape Dorset studio. 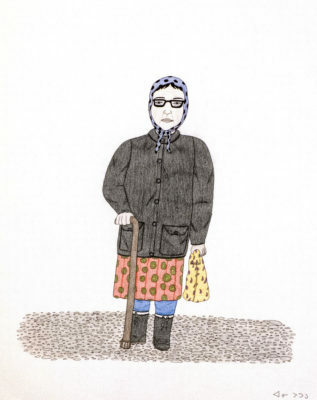 Since 1960, her work has been included in almost every annual collection of Cape Dorset prints. 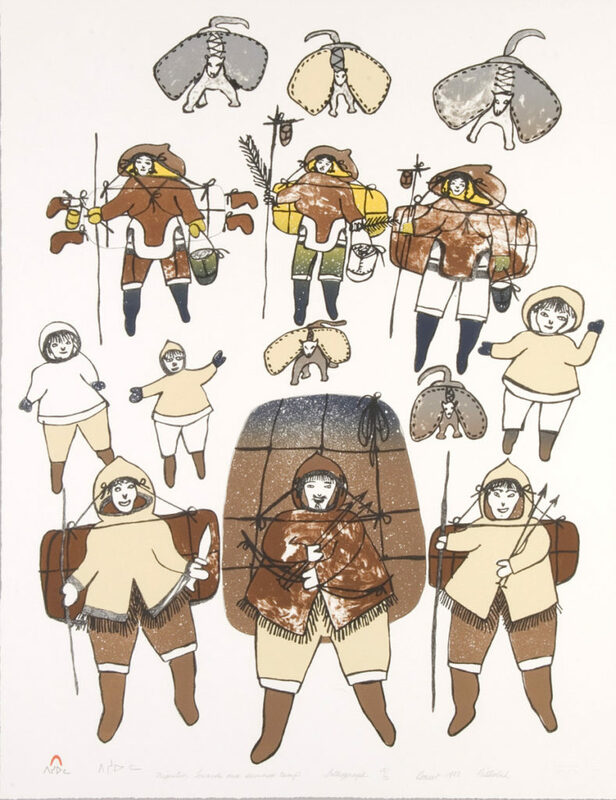 Napachie and her husband moved to Cape Dorset in 1965, and participated in the acrylic painting/drawing workshops established by the West Baffin Eskimo Co-operative. Her interest in landscape and Western notions of spatial composition grew out of this experience. Napachie worked directly in the lithographic medium and experimented with life drawing as a preparatory stage toward the print image. Annie Pootoogook began drawing in 1997 under the encouragement of the West Baffin Eskimo Co-operative in Cape Dorset and released her first print in 2003. Her solo exhibition at The Power Plant Contemporary Art Gallery (Toronto), and subsequent win of the Sobey Art Award – both in 2006, as well as her participation at documenta in 2007, established her as the leading contemporary Inuit graphic artist at the time. Annie’s artwork challenged conventional expectations of “Inuit” art. Her subjects were not Arctic animals or scenes of nomadic existence from a time before settlement life; rather, her images reflect her experiences as a female artist living and working in contemporary Canada. Like her grandmother Pitseolak before her, Annie was an instinctive chronicler of her times. She later explored themes of mortality and spirituality before her untimely and tragic death in 2016. This exhibition is curated by Andrea R. Hanley (Navajo), and organized by the Museum of Contemporary Native Arts at the Institute of American Indian Arts, Santa Fe, New Mexico. Special thanks to the Native Arts and Cultures Foundation for their generous support of this exhibition. The Center for Contemporary Native Art was established through a grant from the Institute of Museum and Library Services and generous gifts from Mr. Mark J. and Dr. Jennifer Miller, Taffy Gould, Anonymous, and Exhibition Series Funders.